Quick fixes are the best, especially the ones that boost your metabolism and help you lose weight. We all like easy, and sometimes there are a few hacks we can do to help the process get started. But like I’ve shown in my post 10 Simple Ways to Increase Metabolism, while working out every week may seem intimidating to you right now, you can get started on losing a few pounds with simpler steps. No need to burn yourself out on diets that starve and exercises that tire you. Start small and when you see the changes, you’ll be inspired to do more. If you’re on the go, but looking for a healthier more weight loss friendly drink than that triple shot espresso white chocolate mocha, then lemon water is an easy fix. A lot of us have heard that if we drink enough water, it helps to boost your metabolism. But if you infuse lemon into it, it takes it to a whole different level. Not only are you putting amazing vitamins into your drink, the lemon also helps to hydrate you more and give your metabolism a nice boost. How to Prepare: Whether it’s in a tall glass or to-go container, fill it up with cold water (cold water also helps to boost your metabolism), and squeeze 1-2 lemon wedges into it. Do this however many times you want in the day to keep yourself hydrated and burning those calories! For years, I really really didn’t like spinach in meals. I was fine with it as a salad, but put it into a hot dinner or a smoothie drink and I was instantly grossed out. It was only around 2 year ago that I actually started to try it blended up with orange juice, and to my surprise… I couldn’t even taste it. It was still a bit of a mental barrier to get around how green the drink was, but all I tasted was the juice. Both spinach and orange juice contain antioxidants and other fat fighting minerals. With fiber and Vitamin C (which both increase metabolism speed), I was packed with energy and ready to go for the day. How to Prepare: There are a couple options you can do with the orange juice. First, use orange juice as is and blend ice cubes in for the coldness. Or, use an ice tray and fill it up with orange juice and freeze (or at least until very cold) and then blend it with a handful of spinach. If you’re using a smaller more single serving blender like the Magic Bullet , then go ahead and put in one handful. If you’re using something that can serve multiple people, put in two (or more if desired). Then enjoy the refreshing and tasty drink! Tea has been said by many to have plenty of antioxidants, but it’s really green tea that beats all the others out. With polyphenols and catechin, green tea will boost your metabolism speed and help you shed the pounds over time. Take it up a notch and add some blueberries and raspberries which are also plenty in antioxidants. Doing this only makes its metabolism boosting benefits even more effective! How to Prepare: Heat up some hot water over the stove (or heat up a mug in the microwave), let the green tea steep for 2-4 minutes, then pop in one handful of blueberries and raspberries together. You can drink it right away or take the tea bag out once it’s done steeping, put it in the fridge overnight (or for a couple hours), let the berries release more of their benefits, and drink it cold. I love hot drinks and this one is great whether you want something hot in the morning or something at night to relax you. This calming drink boosts your metabolism (hence the name) with lemon, cinnamon, and honey. All three ingredients will boost your metabolism speed and help you lose weight with their antioxidants, enzymes, and fiber. How to Prepare: Heat up a mug of water in the microwave for about a minute and a half, then put in a teaspoon (or however much you want), of cinnamon and mix well to dissolve. Then squeeze in a lemon, and add a tablespoon (or less if desired) of honey. It will give you the sweetness you want without making you gain pounds. This combo is packed with amazing hydrating and beneficial energy to help boost your metabolism speed and your strength. Coconut water is extremely good for you and helps you to burn fat faster while chia seeds are packed with antioxidants, fiber, protein, and Omega-3 and 6 fatty acids; all of which helps boost your metabolism. How to Prepare: Pour in as much coconut water into a glass (short or tall) as you want, put in 1-2 tablespoon of chia seeds, place in fridge, and let it sit for 30 minutes to 1 hour as the chia seeds soak up the coconut water. Then can drink up and feel the energy go through you! 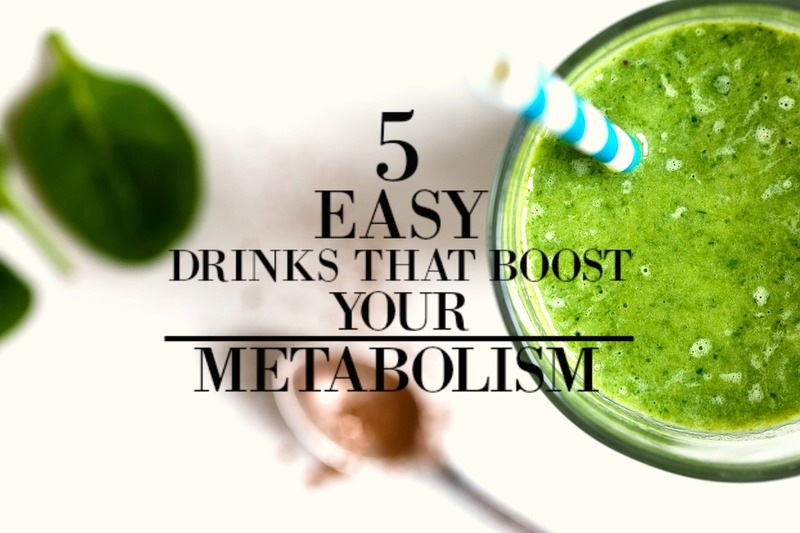 All of these drinks are easy to make and help boost your metabolism speed. That’s why it makes for such a great option if you want to lose weight, but don’t want to burn yourself out. So whether you’re going for a quick pick me up in the morning and drinking the lemon water or blending up the morning green power drink, all are great options to improve your health and weight! Now I hope this was helpful, and if you have an healthy detoxing and metabolism boosting drinks of your own, email me or let me know in the comments! I’d love to hear your ideas!